Fine milk chocolate, bursting with whole roasted hazelnuts and crunchy caramelized hazelnut pieces, for the ultimate in chocolate pleasure. Milk chocolate with whole roasted hazelnuts and caramelised hazelnut pieces. 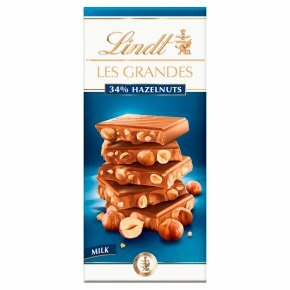 Sugar, Hazelnuts 34%, Cocoa Butter, Cocoa Mass, Whole Milk Powder, Lactose, Skim Milk Powder, Anhydrous Milk Fat, Emulsifier (Soya Lecithin), Barley Malt Extract, Flavourings, Almonds, Milk Chocolate contains: Cocoa Solids: 34% min., Milk Solids: 14% min.